To Cite: Taheriazam A, Hashemi S M, Esmailiejah A A, Keyhani S, Abbasian M, et al. Outcomes of Nonoperative Treatment of Forefoot Fractures: Casting Versus Off-Loading Shoes, Trauma Mon. 2017 ; 22(2):e27533. doi: 10.5812/traumamon.27533. Background: Although forefoot fractures are of the most common orthopedic injuries, there are limited studies regarding the outcomes of nonoperative treatment of these fractures. In the current randomized clinical trial, for the first time, we evaluated the outcomes of nonoperative treatment of metatarsal bone fractures using off-loading shoes compared with casting. Methods: In this study, there were 60 patients with metatarsal fractures without indications for surgical management who were assigned to the two equal groups: casting (group C) and off-loading shoe (group OS). The rate of fracture union was investigated. Also, the pain severity and patient satisfaction were measured based on visual analogue scale (VAS). Patients were followed for six months. In the last examination, American foot and ankle score (AOFAS) was completed. Finally, the outcomes were compared between two groups. Results: Clinical and radiological unions were achieved in all of the fractures. In the last examination, the pain intensity (1.2 ± 0.8 in group C versus 1.8 ± 1 in group OS; P = 0.149) and AOFAS (91.7 ± 15.1 in group C versus 93.2 ± 12.9 in group OS; P = 0.407) were similar. Patients in group OS were significantly more satisfied (7.5 ± 1.1 and 9.2 ± 1.3; P < 0.001). Complications of casting including skin problems, symptoms of deep venous thrombosis, and reflex sympathetic dystrophy developed in four patients. Conclusions: Off-loading shoes are suitable modalities to treat forefoot fractures. Although no statistically significant difference was found between the groups, but due to the comparable outcomes, high patient satisfaction, and lack of complications, nonoperative treatment of forefoot fractures using off-loading shoes is recommended. Forefoot trauma including metatarsal bones and toes is one of the most common orthopedic injuries (1-3). These injuries can be associated with protracted recovery and the long-lasting decreased performance (4, 5). Metatarsal fractures account for about 35% - 80% of all foot and ankle fractures and 5% of all body fractures (6, 7). In an extensive study, it has been shown that metatarsal fractures are the third common fractures of the body and the most common fractures of the foot (8). Although there are limited demographic information regarding toes fractures (9), it has been reported that these injuries account for 8% - 9% of all fractures (10, 11). The annual incidence of toe fractures had been reported between 14 and 39.6 per 10000 persons (12-15). Although it initially may seem to be simple, the treatment of these fractures can be complicated and challenging. Regarding the sophisticated and unique anatomy and biomechanics of the forefoot, treatment of these fractures should preserve the weight-bearing ability and foot flexibility during gait. Obviously, these sophisticated anatomical and biomechanical properties of the foot enables us to walk on even and uneven surfaces with different velocities and any change in these properties can lead to serious problems during walking (16-19). Management of forefoot fractures differ depending on the location of fracture, the amount of displacement, the pattern of fracture, the angular deformity and functional demands of the patient (1-3, 5, 9, 20, 21). Several techniques have been introduced for surgical treatment of forefoot fractures, however, in the selected cases with stable fractures with no or minimal displacement, nonoperative treatment such as immobilization and non-weight-bearing with a short leg cast, CAM boot, immobilizer boot, fracture shoe, hard sole shoe and Buddy taping can be successfully utilized (1-3, 5, 9, 20-23). Among these modalities, short leg casting is more prevalent and it is routinely used in many orthopedic centers. However, despite the advantages of short leg casting, this modality can be associated with several complications such as dermatological problems, joint stiffness and even formation of deep venous thrombosis (24, 25). Furthermore, it seems that 4 - 6 weeks treatment using short leg cast can be bothersome and restrictive for patients with undesirable appearance. Currently, off-loading the foot ulcers using special footwear is one of the primary therapeutic modalities for diabetic patients. Considering the fact that immobilization and off-loading the injured bone can be the basis of nonoperative treatment of forefoot fractures, we hypothesized that these off-loading shoes may be helpful for patients with stable forefoot fractures. These lightweight shoes are more comfortable with more acceptable appearance compared with short leg casts. Additionally, the patient can put off the off-loading shoe in sitting or lying positions and use another type of support. Although there are limited studies regarding nonoperative treatment of forefoot fractures (9, 26, 27), more studies are required to identify the most appropriate therapeutic modality for these patients. In the current study, we compared the clinical, radiological and subjective outcomes of treating stable metatarsal fractures with off-loading shoes and short leg casting. Between June 2013 and August 2014, 60 patients with metatarsal fractures were enrolled in the current randomized clinical trial. After taking history from the patients and clinical examination, forefoot x-rays were taken. The patients with stable metatarsal fracture without displacement which did not need surgical therapy were asked to sign informed consent when they were willing to participate in the study. In the present study, nondisplaced metatarsal midshaft fractures (comminuted or simple) and fracture of the neck or head of the 2nd, 3rd or 4th metatarsal bones were considered as stable metatarsal fractures. Patients with concomitant foot fracture, neuromuscular disorders affecting gait such as hemiplegia due to cerebrovascular accident, cerebral palsy, and poliomyelitis were excluded. The eligible patients were randomly assigned to the two study groups using random number table method: off-loading shoe or short leg casting. In the casting group, the extremity was immobilized using a short leg cast extended from tiptoes to calf area. 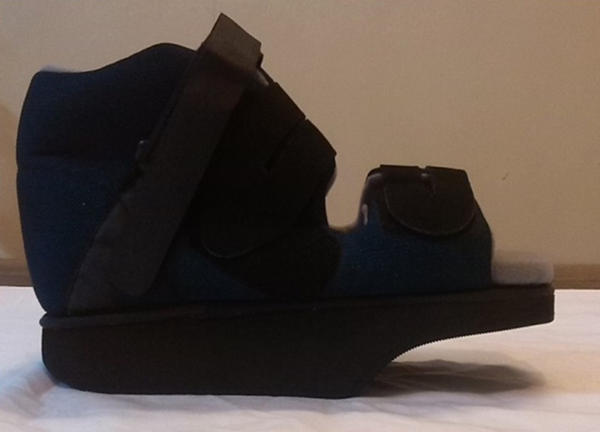 In the off-loading shoe group, patients wore a custom-made off-loading shoe which eliminated the loads over the fractured site (Figure 1). As shown in Figure 1, using off-loading shoe, the forefoot area does not bear any pressure when standing, while midfoot and hind foot regions support the body weight. In both groups, patients were allowed to walk with partial weight bearing using an assistive device. Patients in casting group received thromboprophylaxis based on the patient’s general status. Patients were evaluated at 2nd, 4th and 6th weeks and monthly until the healing was approved with no pain on the fracture site and the presence of three bridging cortices on the images in two orthogonal planes. Then, the cast or off-loading shoes were removed. Malunion was defined as angulation >10 degrees in sagittal and coronal planes or translation > 4 cm. Patients were asked to return for functional and clinical evaluation after 6 months. At the time of cast or off-loading shoe removal, the patients’ satisfaction with the treatment was measured using VAS, in which 0 indicted no satisfaction and 10 indicated the maximal satisfaction with the type of immobilization. In addition, before the treatment and at the last examination (6 months later), the pain intensity was measured using a 10 cm ruler (visual analogue scale, VAS). In this scale, 0 indicated no pain and 10 indicated the worst imaginable pain. The American foot and ankle score (AOFAS) was completed by all patients in last examination. Development of any complications such as deep vein thrombosis (DVT) or skin problems was recorded. Independent samples t-test and Mann-Withney U test were utilized to compare the quantitative data between two groups. In each group, the pre- and post-treatment pain were compared using Wilcoxon test. Furthermore, the qualitative data were compared using chi square test or Fisher’s exact test between two groups. SPSS statistical software ver.15.0 was used. P < 0.05 was considered statistically significant. The demographic characteristics of the patients is compared in Table 1 which indicates that both groups are similar in age, gender, body mass index, and mechanism of fracture (P > 0.05). The distribution of the fracture location is also presented in Table 2. Clinical and radiological union was achieved in all of the patients (Figure 2). The cast or shoe was removed within 8 - 12 weeks after the injury in all of the patients. In casting and off-loading shoe groups, the pain intensity improved significantly from 7.6 ± 1.8 and 8.2 ± 0.9 before the treatment to 1.2 ± 0.8 and 1.8 ± 1 in the last examination, respectively (P < 0.001). However, the pre- and post-treatment pain intensity were similar between two groups (P = 0.529 and P = 0.149, respectively). The AOFAS averaged 91.7 ± 15.1 and 93.2 ± 12.9 in casting and off-loading shoe groups, respectively (P = 0.407). Patients’ satisfaction (VAS) averaged 7.5 ± 1.3 and 9.2 ± 1.3 in casting and off-loading shoe groups, respectively (P < 0.001). Interestingly, there was no treatment-related complication in patients treated with off-loading shoes, while in casting group; two patients developed reflex sympathetic dystrophy (RSD) which was improved with physical therapy. Furthermore, in casting group, one patient suffered from dermatological problems and symptoms of DVT formation occurred in one another. However, there was no significant difference in total rate of complications between two groups (P = 0.112). Despite the fact that forefoot fractures are of the most common orthopedic injuries, there are very limited studies regarding the clinical outcomes of treating these fractures. Several studies on forefoot fractures have addressed the injuries of the some special parts such as fractures of the base of 5th metatarsal bone (Robert Jones’ fracture) or hallux and its sesamoid bones. Aynardi et al. (26) nonoperatively treated 142 displaced oblique spiral fractures of the fifth metatarsal shaft. They demonstrated that nonoperative management can result in excellent and long-term functional outcomes. Delayed union and nonunion occurred in two and three patients, respectively. Two cases with nonunion treated with open reduction and internal fixation. In a similar study, Konkel et al. 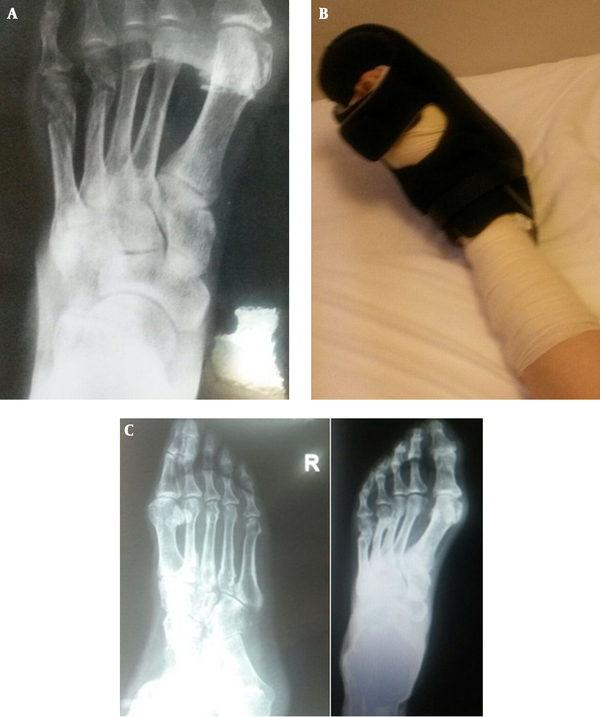 (27) investigated the outcomes of nonoperative treatment of fifth metatarsal fractures. Early weight bearing was allowed and patients were treated ambulatory. Bony union was achieved after 3.7 months in 98.5% of the patients. All of these patients were satisfied with the outcomes. To our knowledge, there is only one epidemiological study investigating the outcomes of nonoperative management of 141 toe fractures using short leg casting or Buddy taping. In 2011, Van Vliet-Koppert et al. (9) reported that these nonoperative modalities were associated with excellent functional outcomes and patients’ satisfaction.As mentioned previously, stable forefoot fractures are treated routinely using short leg casting, in which all of the foot and tarsus joints are immobilized. Although, this method is associated with satisfactory outcomes, it may result in some complications (24, 25). Some researchers have found that treatment with short leg cast can increase the risk of thromboembolic events. Patli et al. (24) found that 5% of the patients treated with short leg casting for tarsal fractures developed deep venous thrombosis. Also, Manafi Rasi et al. (25) demonstrated that DVT is found in 3% of patients with ankle sprain treated with short leg casts. Furthermore, joint stiffness and dermatologic problems are of the most common problems arising from casting. Off-loading shoes are suggested for the first time to treat these injuries; and 3. the outcomes of two nonoperative modalities for forefoot fractures are for the first time compared, prospectively. The current study showed that the two used methods were associated with excellent clinical and functional outcomes based on AOFAS. There was no case of delayed union or nonunion in our study. The pain intensity relieved significantly in the last examination in two groups. In addition, we think that the remaining pain will be greatly reduced with the passage of time. Although, patients of the two groups were highly satisfied with the treatment, however, the patients in off-loading shoes group were significantly more satisfied which indicates that off-loading shoes are appropriate and applicable modalities to treat stable forefoot fractures. Furthermore, there was no case of treatment-related complications in off-loading shoe group, while RSD, dermatologic problems and symptoms of DVT formation developed in four patients who were treated with casting. Based on the same clinical and functional outcomes, higher patient satisfaction, and no complication, using off-loading shoes for treatment of stable forefoot fractures is recommend by the authors. Authors’ Contribution: Study concept and design: Afshin Taheriazam and Ali Akbar Esmailiejah; acquisition of data: Ali Akbar Esmailiejah, Mohammadreza Abbasian, Farshad Safdari, Ali Moazami Pur, Afshin Taheriazam, Sohrab Keyhani and Siamak Moradi; analysis and interpretation of data: Mohammadreza Abbasian, Farshad Safdari, Sohrab Keyhani and Seyed Masoud Hashemi; drafting of the manuscript: Ali Akbar Esmailiejah, Farshad Safdari, Ali Moazami Pur, Afshin Taheriazam, Siamak Moradi and Seyed Masoud Hashemi; critical revision of the manuscript for important intellectual content: Ali Akbar Esmailiejah, Mohammadreza Abbasian, Ali Moazami Pur, Sohrab Keyhani and Seyed Masoud Hashemi; statistical analysis: Farshad Safdari and Siamak Moradi; administrative, technical, and material support: Ali Akbar Esmailiejah, Mohammadreza Abbasian, Farshad Safdari, Ali Moazami Pur, Afshin Taheriazam and Sohrab Keyhani; study supervision: Ali Akbar Esmailiejah, Mohammadreza Abbasian, Farshad Safdari, Ali Moazami Pur, Afshin Taheriazam and Sohrab Keyhani.